Herrera is the author of thirty books, including collections of poetry, prose, short stories, young adult novels and picture books for children. His collections of poetry include Notes of the Assemblage (City Lights, 2015), Senegal Taxi (University of Arizona, 2013); Half of the World in Light: New and Selected Poems (2008), a recipient of the PEN/Beyond Margins Award and the National Book Critics Circle Award; 187 Reasons Mexicanos Can’t Cross The Border: Undocuments 1971-2007 (City Lights, 2007); and Crashboomlove: A Novel in Verse (University of New Mexico, 1999), which received the Americas Award. In 2014, he released the nonfiction work Portraits of Hispanic American Heroes (Dial), which showcases twenty Hispanic and Latino American men and women who have made outstanding contributions to the arts, politics, science, humanitarianism, and athletics—a magnificent homage to those who have shaped our nation. His book Jabberwalking, a children’s book focused on turning your wonder at the world around you into weird, wild, incandescent poetry, is forthcoming in 2018. His books of prose for children include: Jabberwalking (Candlewick Press, 2018); SkateFate (Rayo, 2011); Calling The Doves (Children’s Book, 2001), which won the Ezra Jack Keats Award; Upside Down Boy (2006), which was adapted into a musical for young audiences in New York City; and Cinnamon Girl: Letters Found Inside a Cereal Box (HarperCollins, 2005), which tells the tragedy of 9/11 through the eyes of a young Puerto Rican girl. From 2012-2014, Herrera served as California’s Poet Laureate, appointed by Governor Jerry Brown. As the state Poet Laureate, Herrera created the i-Promise Joanna Project, an anti-bullying poetry project. Joanna was an elementary school girl who was bullied and killed in an afterschool fight in Long Beach. The first half asks students to send in poems about experiences and effects of bullying. The second half of the project is to take action in preventing bullying. Herrera hopes to collect the poems and publish it as a book in the future. Other projects included Answer Cancer with a Poem, Show Me Your Papers, and The Most Incredible and Biggest Poem on Unity in the World. Juan Felipe Herrera, the first Mexican-American Poet Laureate in the USA, is sharing secrets: how to turn your wonder at the world around you into weird, wild, incandescent poetry. Can you walk and talk at the same time? How about Jabberwalk? Can you write and draw and walk and journal all at the same time? If not, you’re in luck: exuberant, blue-cheesy cilantro man Juan Felipe Herrera, Poet Laureate of the United States, is here to teach you everything he knows about being a real-life, bonified, Jabberwalking poet! 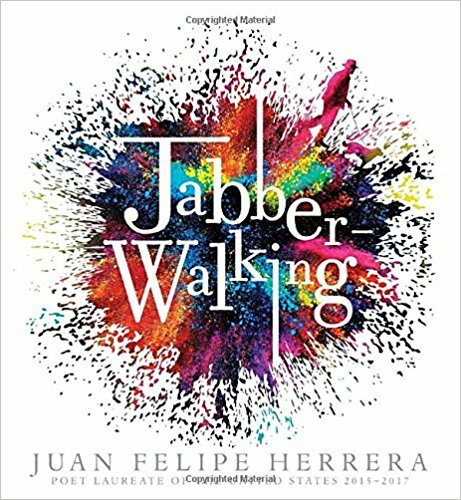 Jabberwalkers write and speak for themselves and others no matter where their feet may take them — to Jabberwalk is to be a poet on the move. And there’s no stopping once you’re a Jabberwalker, writing fast, fast, fast, scribble-poem-burbles-on-the-run. Scribble what you see! Scribble what you hear! It’s all out there — vámonos! Juan Felipe Herrera, the first Latino Poet Laureate of the United States and son of Mexican immigrants, grew up in the migrant fields of California. Notes on the Assemblage brims with the exuberant vision and hard-won wisdom of a poet whose life and creative arc have spanned chasms of culture in an endless crossing, dreaming and back again. “I wish I could find the words to tell you the story of our village after you were killed.” So begins Senegal Taxi, the new work by one of contemporary poetry’s most vibrant voices, Juan Felipe Herrera. Known for his activism and writings that bring attention to oppression and injustice, Herrera turns to stories of genocide and hope in Sudan. Senegal Taxi offers the voices of three children escaping the horrors of war in Africa. Unflinching in its honesty, brutality, and beauty, the collection fiercely addresses conflict and childhood, inviting readers to engage in complex and often challenging issues. Senegal Taxi weaves together verse, dialogue, and visual art created by Herrera specifically for the book. Stylistically genre-leaping, these many layers are part of the collection’s innovation. Phantom-like televisions, mud drawings, witness testimonies, insects, and weaponry are all storytellers that join the siblings for a theatrical crescendo. Each poem is told from a different point of view, which Herrera calls “mud drawings,” referring to the evocative symbols of hope the children create as they hide in a cave on their way to Senegal, where they plan to catch a boat to the United States. This collection signals a poignant shift for Herrera as he continues to use his craft to focus attention on global concerns. In so doing, he offers an acknowledgment that the suffering of some is the suffering of all. Lucky Z has always lived on the edge—he loved to skateboard, to drag race, to feel alive. But things have taken a turn—he’s living with new foster parents and a tragic past. An accident changed everything. And only his voice will set him free. 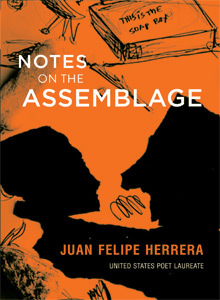 For nearly four decades, Juan Felipe Herrera has documented his experience as a Chicano in the United States and Latin America through stunning, memorable poetry that is both personal and universal in its impact, themes, and approach. Often political, never fainthearted, his career has been marked by tremendous virtuosity and a unique sensibility for uncovering the unknown and the unexpected. Through a variety of stages and transformations, Herrera has evolved more than almost any other Chicano poet, always re-inventing himself into a more mature and seasoned voice. Now, in this unprecedented collection, we encounter the trajectory of this highly innovative and original writer, bringing the full scope of his singular vision into view. Beginning with early material from A Certain Man and moving through thirteen of his collections into new, previously unpublished work, this assemblage also includes an audio CD of the author reading twenty-four selected poems aloud. Serious scholars and readers alike will now have available to them a representative set of glimpses into his production as well as his origins and personal development. The ultimate value of bringing together such a collection, however, is that it will allow us to better understand and appreciate the complexity of what this major American poet is all about. In this novel in verse—unprecedented in Chicano literature—renowned poet Juan Felipe Herrera illuminates the soul of a generation. Drawn from his own life as well as a lifetime of dedication to young people, CrashBoomLove helps readers understand what it is to be a teen, a migrant worker, and a boy wanting to be a boy. Precise and profound, CrashBoomLove will appeal to and resonate with high school readers across the country. I am merely posing for a photograph. for my camera, that is all.” . . . yes, that may just work. what if all this is not visible. the mountains, the spliced wombs across Israel, Syria.